The government’s aim for transparent tertiary education has attracted a cautious optimism, writes Adam Chalmers. On April 2, the federal government finally released MyUniversity – a website where visitors can compare different universities and university courses, and find important information about tertiary education in Australia. According to The Age, Tertiary Education Minister Chris Evans said the website would “help drive universities to lift performance and quality”, as the MySchool website aims to do for primary and secondary education. 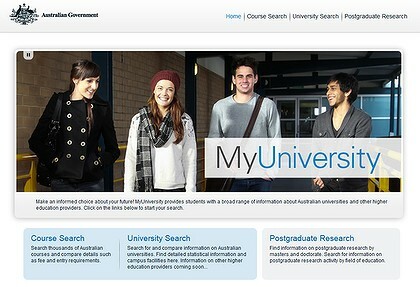 Plans to build the website were first announced in 2010 at the annual Universities Australia conference. MyUniversity is being marketed as a twin to MySchool, a government website which lets students, parents and teachers analyse data from schools across Australia. Users can compare measurements for each school, including its average NAPLAN results and socio-economic status of parents. Both websites are spiritual successors to the FuelWatch and GroceryWatch websites promised by the ALP as one of their 2007 election policies. Reception has been mixed, but overall an air of cautious optimism surrounds the website. National Union of Students president, Donherra Walmsley, told the Sydney Morning Herald, “we are pleased to see vital information such as student staff ratios and campus services included on the website”. But the organisation would “like to see a greater level of detail provided in both these areas,” she said. Head of Universities Australia, Belinda Robinson, welcomed the greater transparency within the university community, but had concerns about the website’s accuracy. ‘’We don’t believe the website is there yet, particularly in relation to attrition rates, staff-student ratios, the entry score cut-off search function, course mapping and searchability,” she said earlier this month. When MySchool was first released it drew highly negative reactions, with the principal of Victoria’s top-performing school calling it a “crock” because it inappropriately lumped students of the same school into the same socio-economic status group. But with time, the website was refined to address these issues. Similarly, it is hoped future versions of MyUniversity will be more comprehensive. Australian Catholic University Vice-Chancellor, Greg Craven, called MyUniversity a “useful tool” but reminded people it was not the be-all and end-all of University analysis.